Michael Cook has pursued the elusive, mythical art beast throughout his entire life. Now, after exhibiting his paintings in over 70 galleries and museums throughout the United States, his work is represented in numerous private collections around the world. In art that traverses and integrates a wide spectrum of "styles" from contemporary realism and surrealism to lyrical abstraction, his focus is nevertheless consistent-presenting the elemental and spiritual essence of the natural world, from traditional landscapes to metaphysical investigations. 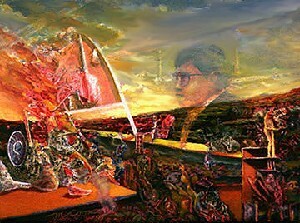 Visit artinsight.com to learn more, and to see over 250 examples of this important artist's work. The primary objective of my work is to convey the essence of the natural world. Within the structural patterns of nature there is an astounding complexity-and an elegant simplicity. Both extremes are just different aspects of the same thing, and it is within this paradox that we all exist. At various points along this continuum, I stop and try to distill the essence. These paintings are the result. I generally work in a representational mode because it's important to me that the paintings are visually accessible, and resonate most naturally with collective human experience. I find the landscape genre (in its most generic sense) best suited to these explorations. So in addition to being intimate studies of light, atmosphere, color and tonal value, etc., the paintings can also serve as metaphors and questions-allowing all the other diverse implications, undercurrents and perceptual strata to emerge subtly, beyond the scope of a cursory glance. Please refer to Artinsight.com for an extensive listing of the numerous galleries and museums that have exhibited Michael Cook's art. His work is in private collections throughout the world.